You are here: Home / All Freebies / Riddles for Thanksgiving Fun! Pilgrims, Mayflower, cranberries, cornucopia, harvest… it’s enough to make a first grader dizzy! Riddles are a great way to help get all those new Tier 2 and Tier 3 words for Thanksgiving under control, while also addressing Common Core standards for key details and questioning. 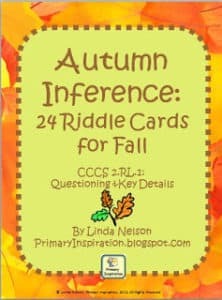 Enjoy this set of riddle cards, answer cards, and student response page!